So apparently the heads-up-display was invented by a wrestler and financed by all his wrestler buddies. If this story doesn’t have the makings of a feel-good Disney movie I don’t know what does. Who should play the Mad Greek? What role will Brendan Fraser and Cuba Gooding Jr play? Will there be talking animals? 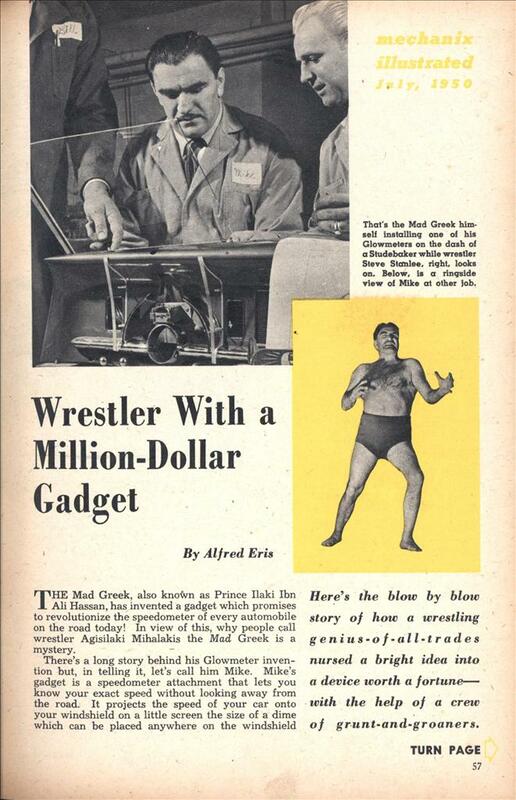 Here’s the blow by blow story of how a wrestling genius-of-all-trades nursed a bright idea into a device worth a fortune— with the help of a crew of grunt-and-groaners. THE Mad Greek, also known as Prince Ilaki Ibn Ali Hassan, has invented a gadget which promises to revolutionize the speedometer of every automobile on the road today! In view of this, why people call wrestler Agisilaki Mihalakis the Mad Greek is a mystery. There’s a long story behind his Glowmeter invention but, in telling it, let’s call him Mike. Mike’s gadget is a speedometer attachment that lets you know your exact speed without looking away from the road. It projects the speed of your car onto your windshield on a little screen the size of a dime which can be placed anywhere on the windshield without interfering with your vision. The screen changes color like a traffic signal so that you’re conscious of changing speeds without even having to look at the black numerals which are also projected. Sound simple? Well, in theory it is— but it took years of development sandwiched between Mike’s writing, lecturing and wrestling. Upon first sight the Glow-meter may not seem world-shattering to you (it didn’t to its inventor, either) but soon you begin to realize its potentialties (as did the manufacturers) and it dawns on you that here is a real million-dollar gadget in the flesh. Would you like to know how a million-dollar gadget gets to be a million-dollar gadget? Well, let’s follow Mike right from the start. Admittedly, this story is a bit extraordinary—but then, so are million-dollar gadgets. It started in 1935 when Mike was driving a brand-new car along a flat stretch of highway between Muskegan and Battle Creek, Michigan. He tried to keep under 30 mph but was having his troubles, what with trying to avoid running off the road and keeping an eye on the speedometer. “Why can’t someone build a speedometer,” he wondered, “that’ll enable me to tell my speed without taking my eyes off the road?” Being an inventive lad, his thoughts wandered to a method of rigging up warning bells. But he quickly discarded this idea—it would have to be something completely new, he thought. First, he decided that the best solution would be to project colors and figures right on the windshield. But he discovered that when he projected them directly, the result was highly unsatisfactory. It was too distorted and the projection could easily be washed out by the sun. So, he started working on a special screen. Naturally, during this time, he was doing other things. Ever since he was 12 years old he had been turning out pulp stories for the magazines. That’s how he got his name—when an editor wanted Arab stories, Mike became Prince Ilaki Ibn Ali Hassan. All in all, he sold some 360 blood-curdling epics before he grew a little bored. So he turned to songwriting, then switched to photography and repairing pipe organs. But soon his career became stabilized when he decided to devote all his efforts to wrestling and inventing—as unorthodox a combination as possible. Mike loved every minute of it. But, in between falls with bearded terrors, masked marvels and assorted bone crushers, he continued to wrestle with spherical aberrations, optical formulas and angles of incidence. For he was still obsessed with inventions and during this time developed an automotive gimmick which he foolishly turned over to one of the biggest Detroit manufacturers for peanuts. Mike was fascinated by movie cameras, too, and devised the only rear-operative Bolex in the United States. Not content, he developed an automatic turret operated by a button and a positive parallax-correcting device which worked directly through the lens. Then, the Army took a few years out of his life and soon Mike found himself back in the swing of things, wrestling and working on his inventions. During this time he developed a screen for the Glowmeter, so selective that it reflected a projected image at any desired angle while rejecting all other extraneous light beams. He became so absorbed in his gadgets that in March, 1949 he found himself stranded in Buffalo, N.Y., flat broke. He hadn’t wrestled for months, $12,000 of his own money had gone down the drain, his doctor had warned him about his heart— and he didn’t seem to be a step closer to production. At this point, the weirdest phase of a weird career began. A guy like Mike makes lots of friends in his travels and Mike certainly had his share of acquaintances in the profession. Word spread among the wrestlers that their genius was having trouble financing himself. A plan seemed to develop all by itself. One day, the door of his room in the Buffalo Hotel opened and in strode Steve Stanlee, brother of the mat champion Gene Stanlee. He listened to Mike talk about his inventions, then drew 12 one-hundred dollar bills from his pocket and put them on the table. He took his hat and strode to the door. “I’ll be back to lend you more as soon as I make it!” he said. That started it. One wrestler after another popped in unexpectedly, leaving money to help Mike carry on. Huge Wee Willie Davis, just back from the Canadian border, lumbered in and he plunked down fistfuls of Canadian money. Buffalo Bill Cody and Dock Len Hall also stopped by every now and then to thrust their earnings on Mike. Even during the slow season—the summer months—nobody even thought of asking for the return of the borrowed money. Instead, the wrestlers kept on giving. Mike worked in his hotel room sometimes for five consecutive days and nights. He’d eat only when Buffalo Bill or some other wrestler would scrape up enough. money for a few hamburgers or hot dogs. The room at the Buffalo hotel was unlike any other hotel room in the world during this period. It was more like a vest-pocket engineering lab. Tools and metal parts were filed under the bed. Where Mike’s shirts belonged, there was a range of hardware. A soldering iron lay on the bed and a vise was clamped to the radiator. The writing desk served as a workbench. No part of the room was safe from paint or volatile mixtures. Mike had drawn a chalk line upon the floor, across which the maid dared not tread. Glenn Cardan, the hotel manager, would drop in periodically to gasp and shudder—but still encourage the fanatic inventors. Crammed into the small area were always the hulking figures of three or four wrestlers helping Mike. One of them was Wee Willie Davis (maybe you’ve seen him as Garmiskar, the giant, in the picture Sampson and Delilah). He’s a skilled engineer and holds a degree from Virginia Polytechnic Institute. Soon, Mike was ready to try to sell some of his inventions. He considered a tire-pressure valve which would prevent the accumulation of too much tire pressure his most important invention. He attached that, as well as the Glowmeter, to his car but soon found clients fascinated by the tiny screen image instead of the pressure valve. So, he decided to concentrate on the Glowmeter. At first manufacturers didn’t believe in the magic of his miracle screen. Once, he demonstrated the gadget to the engineering head of one of the top car manufacturers. “My optical expert says that an ordinary bit of white paper will do exactly what your Glowmeter screen does,” said the man. Mike said nothing but tore off a piece of white paper and placed it over the screen. Sure enough, the speedometer was projected from the dashboard onto the paper clearly. Then, Mike took a powerful flashlight and pressed the switch, directing the beam on the windshield. It completely blotted out the projected speedometer reading. Mike then threw away the white paper and there was the image on the Glowmeter screen as brilliant as ever—the flashlight couldn’t wash it out any more than could the sun. The engineer was convinced. Gradually, word leaked out about this amazing gadget and offers started to trickle in. Somebody offered Mike $150 to install a single Glowmeter in his car. Then, one firm bid $10,000 for manufacturing rights and soon raised it to $20,000. But the wrestlers refused. They knew it was worth much more. The pace was getting faster now and the temptations were almost unbearable. The tiny band of wrestlers was broke—but confident. Mike had to take a few jobs wrestling but his friends still didn’t urge him to sell. Then, one day it came—an offer of $100,000. The wrestlers swallowed hard, talked it over —and voted no. Now, the highest bid of all— an offer of $200,000! But the company insisted upon 50 per cent of all future profits. Again they discussed the offer, and again the adverse decision was made. The group knew that 50 per cent of the future profits might turn out to be an exhorbitant sum. As he hesitantly turned the handle to leave, the manufacturer called out, “You win, Mike —it’s a deal on your own terms.” That’s how the Silver Creek Precision Corporation of Silver Creek, N. Y. came to be the manufacturer and sales agent for Glowmeter. From that point on, things started breaking right for Mike and company. He had filed his own patent applications without a lawyer and soon word came from the patent office that Uncle Sam had approved 28 interlocking claims. It would have been a terrific achievement for a crack patent lawyer, let alone a wrestler. Mike now has some of the top patent lawyers working for him and expects many more claims to be approved soon. There’s a slim chance that some 1951 models of well-known cars will be equipped with Glowmeters. 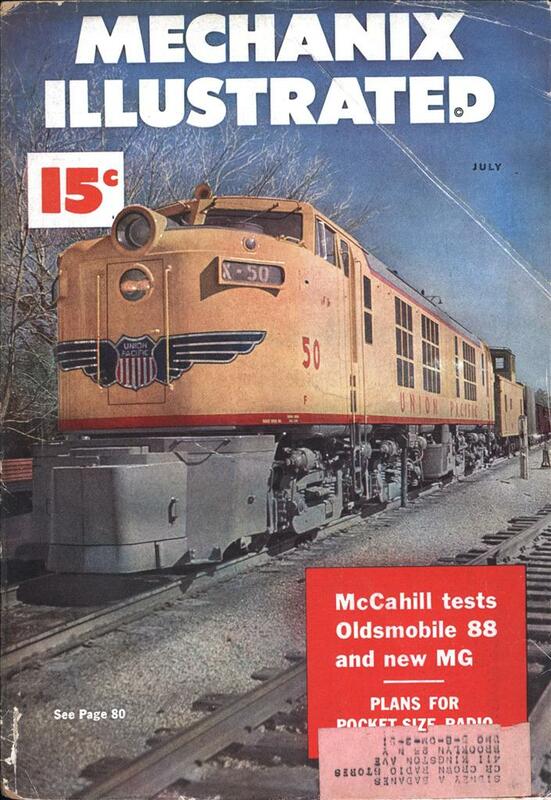 However, it’s a certainty that many of the top-notch Detroit buggies will be sporting them in their 1952 edition. In his shop right now, he’s working on two Studebaker dashboards and pilot models for the GM cars as well as for Nash and Packard. Experts who have seen the Glowmeter in operation predict that some day soon, state Safety Councils and insurance companies may insist on Glowmeters for all new cars. But that isn’t all for Glowmeter. Movie firms are eyeing it—because it can make daylight projection a reality. And Mike is in the process of working out all sorts of varied uses for the gadget in almost every field. But this Mad Greek is not going to stop with his first million-dollar gadget under his belt. Not by a long shot. He’s working up such devices as a torque conversation-type transmission, a wireless telephone, a universal joint, a device to multiply traction potential of any car . . . and many others. HOW DO YOU LEARN TO BUILD A MILLION-DOLLAR GADGET!?!?! Here is a better schematic of how it worked. So he invented the heads up display? Well as to whether or not it is a heads up display, I guess depends on your definition one. The one thing I like about the web site as you see how many modern ideals, or actually just refinements on old concepts that just lacks some key components. Mcubstead: Oh it’s definitely a heads up display, the question was whether he invented the first one and the answer was no. Hirudinea: I hear RVD is working on one of those. Heads-up displays were widely used as aiming sights in World War 2. They were introduced in the late 30s. The technology is actually simple, but you either need a rough reflecting surface or the head needs to be in the right position.